errors. This is a consequence of a variation reduction between sample units of a same group, related to variation between sample units of different ones. Sample size was determined in two stages. In the first one, a “pilot” sample was created to raise previous information about the population, considering a maximum error of 5%. This value was also adopted to test’s significance level. The second stage is the sample calculation, in which pilot sample results were used. Statistic classic equations, detailed by LEITE  were used for calculations of stratified sampling with piece’s casual distribution. Since the number of analyzed factors is small and it was necessary to identify possible grouping and number of groups, the neural networks technique was used. This method is very efficient for problems of multivariate analysis, grouping and prediction, besides hierarchic agglomerative techniques: centroide and Ward . Euclidian distance, which is a multivariate measure , was used in pieces selection into the groups. In agreement to data complexity a technique was selected to get to results. Also, it was developed in Matlab a special software to perform the statistic data treatment. After data treatment and conglomerates detachment, preliminary percentages of the analysis’ factors were calculated (Table 1). During the data processing, it was identified that the problems found in systems were repetitive. This fact allowed a reduction in the number of samples to be visited. As a part of this project, softwares were developed as assistant tools that help to identify the main characteristics of the studied system. One of them, developed in Matlab, estimates the necessary collector area and the storage tank volume, through radiation calculations  in tilt and arbitrary oriented planes for any location and economy level required, based on the modified model of F-Chart . Shading incidence in solar collectors arrays is introduced in these calculations to achieve its influence value over monthly and annual energy economy generated by the solar system. To validate obtained data, this software also simulates the value of monthly electric energy bill for studied residences, through daily bath habits and other family use of electric household appliances. Shading incidence values and consequent solar radiation reduction over the solar collectors’ plane were calculated using Ecotect 5.20 (Figure 3), which is an environment analysis tool, and a scripting, developed by the project’s team. Thus, it was possible to estimate the reduction, due to these shading data, of annual F-chart value for each studied system. Moreover, studies indicate that hourly data is the most adjusted for shading analysis, because, similar shading values can promote different reductions in the incident radiation depending on the hour observed. The promotion of renewable energy systems among the young people represents a must in the education of advancing good life and good environment. One of the first steps in this process consists in training the teaching staff to be able to accurately provide, the knowledge from this field, to the pupils. This idea was the main starting point of the Socrates-Comenius 2.1 project “Sustainable Energy — An European Training Tool” (SEE EU Tool), begun in 2005. The project, gathering a multi-actor partnership, involves education providers and beneficiaries from eight countries and aims to develop a curriculum and a training course in the field of renewable energy systems and sustainable environment solutions dedicated for in-service teachers training. The SEE EU Tool project provides an European frame for teacher in-service training on sustainable development, focusing on renewable energy systems for environment protection. The paper presents an analysis and a synthesis of the project results: the frame, the needs analysis, the curriculum, the specific methodology and the main outcomes. At international level, the necessity of raising awareness towards sustainability in the energy sector is well-known, from both perspectives: producers and users. The subject of renewable energy is known as being important, but it is widely recognized that it is a lack of specific knowledge, . Education of youngsters in the field of renewable energy systems is important in preparing the future scientists, developers and consumers in the field, as well as in directly supporting the sustainable development aim, . The first requirement in pupils’ education consists in training a core of teaching staff able to provide accurately, the knowledge in this field. This idea was the main starting point of the Socrates-Comenius 2.1 project “Sustainable Energy — An European Training Tool” (SEE EU Tool), that runs beginning with 2005, [3, 4]. Close to its end, the project developed the curriculum and training instruments, based on an extended needs analysis; testing courses were run as short sessions (2007) and full course (2008). The paper presents an analysis and a synthesis of the project results and of its main outcomes. The European Union has set an ambitious target for renewable energy of 20% of the total energy demand. Currently the contribution from solar thermal is less than 1% of the total renewable energy production in the EU. The European Solar Thermal Technology Platform (ESTTP) shows that the contribution can grow to 50% of the total European heat demand. The calculation of the contribution of solar thermal heat to the energy balance in Europe has a lot of uncertainties. In the ThERRA project (funded by the EU EIE-programme) the method for calculating renewable heat is developed. A simple formula is proposed to calculate the renewable energy production form solar thermal collectors. By means of cross ventilation skylights fresh air is maintained inside the house. By creating skylights, at the center of the house the natural daylight enters into the heart of the building, considerably reducing the dependence on artificial lighting. This is supplemented by a skylight roof and energy — efficient artificial lighting. An incandescent bulb only uses around 10% of the input energy to create light while the rest appears to be in the form of heat as waste. 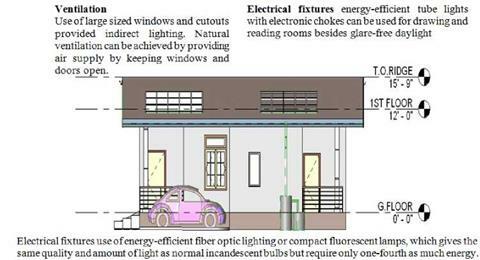 The design criteria adopted in modular house design to possess a good quality of air and utilization of Natural Lighting is described in the below diagram. An analysis of the t implications of bioclimatic design on architecture and constructive aspects was done and this survey shows that in Peru the population has been applying bioclimatic techniques for intense heat (coast) and intense cool (mountains). In what concerns the recent edifications were identified some with elements, shapes and materials that reveal to be a bioclimatic project, however, the inexistence of documental elements does not allow confirming the purpose of the architects. As architecture examples were selected: Universidade Nacional de Puno, Hotel Atualpa de Cusco, Faculdade de Direito da Universidade Privada Antenor Orrego, Templo Maria Auxiliadora, Albergue rural Suasie Centro Virtula de Salud Qotowincho . Fig. 10. Buildings in Peru. was concluded that the problem is on the losses through the ceiling and that the raw hearth walls were suitable and in a first approach that that the orientation at that height is not determinant . In Figure 11 is compared the experimental measurements and the simulation results. Fig. 11. Social house, thermal model and simulation results. control, to elaborate standardised system schemes, and to promote the solar air-conditioning technologies. Activities especially in pre-engineering of small systems and on recommendations for custom made large systems are in the focus of the new Task 38 of the IEA, Solar Air­Conditioning and Refrigeration . Here, the SOLAIR project fits well with its promotional work concentrating on small (< 20 kW chilling capacity) and medium-sized applications. This focus is of special interest, since recently a number of European manufacturers went on the market with new small chiller developments in the capacity range between 4.5 kW and 30 kW. A survey on current and available small and medium-sized SAC appliances has been elaborated by the SOLAIR consortium including a review of monitoring experiences and the identification as well as an analysis of successful running systems . Within SOLAIR, data from successful running applications on solar cooling and air-conditioning in the small and medium cooling capacity range were collected. Table 1 summarises briefly the content of this database. More details are given in the cross-country analysis report of the database within SOLAIR . Cooling; DECliq = liquid desiccant cooling. To motivate potential market actors and contribute to a stronger market implementation, the future market potential of small and medium-sized SAC appliances was analysed. The analysis was focused on the definition of the areas of application, on the legal frameworks and subsidy schemes as well as on the identification and description of customer and investor groups . From this study it was possible to conclude that there is a great potential in the residential housing sector for SAC. There are 61,317,627 residential buildings in total in the project partner countries. Quite a share of them is multi-family houses. These buildings are the most appropriate for small and medium sized solar cooling systems. The share of privately owned buildings in this sector is also large so the financing parties are in most cases private investors. Specially Italy, Spain and Portugal, which are the most appropriate countries for using solar energy for cooling, have a great share of 90% privately owned flats. In this case the most important effort to promote SAC is to motivate the private sector for renewable energy sources showing qualities and financial benefits of solar cooling. Practically all universities in Czech Republic include in their study programmes courses on the environment, in which are general information about renewable energy sources. However, programmes directly aimed at educating specialists in photovoltaics have been developed only at the Czech Technical University (CTU) in Prague. At the Faculty of Electrical Engineering, CTU in Prague, research on producing silicon solar cells first became a subject for student research projects in 1985 — 1988. With the aim of raising the interest of students, a course on Solar Energy Exploitation Systems, mostly dealing with photovoltaics, was introduced in 1995 as an optional course. This course was developed to introduce undergraduates to the main issues in solar energy conversion, mostly oriented on photovoltaics. It provided detail information from photovoltaic effect theory, cell construction and technology to applications, including operating conditions and economic and environmental problems . In period 1995-2005, more than 20 students per year chose this course as a part of their study programme. To meet the increasing demand for photovoltaics, a course in Photovoltaic Systems, dealing with PV system technology (28 hours of lectures, 28 hours of exercises) now forms part of the master study programme in Electrical Engineering and Information Technology. In the field of photovoltaics, materials science and solar cell fabrication technology seem be of special importance, the projected progress in photovoltaic applications calls for a decrease in solar cell (or module) costs to 20% of present-day prices. The main features of significant materials therefore need to be introduced and explained. For practical applications, information about basic types of photovoltaic systems, including structures and energy storage systems are key electrical engineering information for optimising conversion from solar to electrical energy. It is also necessary to provide detailed information about the basic power and control electronic circuits used in photovoltaic applications. When working on photovoltaic system projects, it is very important to know about meteorological and other operating conditions, and also about the economic aspects of photovoltaics. In an attempt to cover all the main aspects of photovoltaic systems and to give due prominence to the various important factors, the classes have been structures as shown in Table 1. Lectures provide a broad theoretical background for understanding problems in the field. Applications-oriented exercises form a very important part of the course, and are adapted to the requirements of electrical engineers. Details about the laboratory exercises synopsis and individual laboratory tasks are given in . 2007/2008 academic year. This course concentrates in more details on practical photovoltaics applications in energy efficient buildings (on-roof and facade installations of PV systems). Solar energy (spectra, geographic position and influence of climate). Present trends in the field of photovoltaics. At present, a new course on Systems for Solar Energy Exploitation has been prepared to be a part of of the bachalor study programme in Electrical Engineering and Information Technology. This course takes into synopsis also solar thermal systems; even the most interest is oriented on electrical energy production. This course is prepared to for new curricula starting in the school year 2009/2010. Synopsis of lectures on Systems for Solar Energy Exploitation is show in Table 2. There are cooperation links with some other European Universities. Lectures on Photovoltaic Systems are given also in English for stuents coming to study at the Czech Technical University in the framework of ERASMUS programme (about 15 students per year have taken part in it). Teachers from the CTU Prague participate also in preparing lectures at European Summer School on Solar Energy in Patra (Greece), PhD. course on Photovolaics in Aalborg (Denmark) and in using ICT tools for education in the field of potovoltaics. Besides education on an university level, short courses and trainings are being prepared for engineers and technicians. Courses are organised by both universities (e. g. Czech Technical university has developed a short course on Renewable Energy Sources for energy producing company CEZ) and private companies (such courses should be university acredited). Some courses and workshops are organised also by professional organisations and by companies producing or selling PV technology. These courses are usually oriented on a particular areas or products and a relatively high level of general knowledge of participants, that they can obtain in the above described public education system, is desirable. The Czech education system is developing in a synergy with increasing demand for building photovoltaic systems in Czech Republic. At the university level, the leader in the field is Czech Technical University in Prague. Specialised courses on photovoltaics have been developed for preparing specialists for very quickly growing segment of photovoltaic industry and for energy generation by photovoltaic applications. The course developed for the MSc study in the field of electrical engineering gives information on both device and application approach with application oriented laboratory measurement tasks. For new curricula (starting in the year 2009), a new course on Systems for Solar Energy Exploitation has been prepared to be a part of of the bachalor study programme in Electrical Engineering and Information Technology. New course on photovoltaics as a part of curricula of the MSc study in a branch “Intelligent buildings” has also been developed, to increase knowledge of civil engineers. This way, specialist for very quickly developing field of photovoltaic industry and applications are prepared. At present, low-temperature collectors are widely used. There are also many other high-quality products on the market, which follow different approaches, depending on climatic conditions and applications. However, in view of the anticipated market development, a number of technological challenges are arising. Some of the key issues include cost reduction, higher quality, aesthetics and building integration. • further development of collectors conceived for vertical uses (facades), including large-area facade-integrated collectors, which can be combined with so-called active walls or with photovoltaic modules. Higher levels of building integration require new rounds of RD&D efforts in close co-operation with architects, construction companies and manufacturers of building envelopes. A related issue is collector size, which is traditionally relatively small (around 2m2). However, there is a recent trend towards larger collector dimensions, implying a different set of conditions for collector design, manufacturing, logistics and installation. In this area, there is significant potential for technological development. Taking into account the projected rapid increase in market size, the recycling potential of materials used in the solar collectors will be a major issue. The lifecycle assessment of the whole solar thermal system, taking into account the fuels and the materials they replace, will also be crucial. New approaches, such as the active wall that heats and cools the room behind it, are very promising and should be developed. For all issues mentioned here, specific RD&D attention should be given to air and vacuum tube collectors. Although air collectors have great potential, particularly for applications such as space heating, ventilation and space cooling by ventilation, they are less developed than liquid-based collectors. For vacuum tube collectors, the potential for further development lies mainly in improved building integration. This includes easier tube replacement in case of failure, resistance to stagnation, possible thermal improvements and longevity. Clearly, a major issue is the automation of manufacturing processes, particularly for collector construction, where there is still great potential for increased productivity. • More efficient ways to use conventional collector materials (metals, glass, insulation), especially with a view to developing multifunctional building components, which simultaneously act as an element of the building envelope and a solar collector. • Evolution in the optical properties of collector components. In particular, a more systematic use of optical films to enhance heat/light transmission through glass covers and reduce this transmission during excessive exposure; and the use of colours in absorbers or covers to achieve more flexible integration concepts. • Alternative materials for collector production: the use of polymers or plastics, the coating of absorbers optimised to resist stagnation temperatures and new materials to prevent deterioration resulting from UV exposure. • Improvement in the recycling potential of collector components and materials in view of lifecycle cost reduction, and overall sustainability of materials. • A dedicated concept for the automation of manufacturing processes and assembly techniques. According to Nasar (1999), in design and architecture competitions the promoter chooses among the competing designers and architects the design for the specific project that better feats his interests. What about architects and designers? How do they see architecture and design competitions? Competitions advantages are identified as an excellent way to discover new talents, innovative designs and generate publicity both to the project and competitors, especially the winner that acquires status and recognition. Quoting Cesar Pelli in Nasar, “Competitions have great potential because they open up opportunities to talented architects that may be young and unrecognized to become recognized”. Another relevant advantage is the opportunity to explore new solutions and to raise awareness for new materials and applications as presented by Larry N. Deutsh in Nasar: “I look at what wins design competition to see what kind of new and inventive use of materials are out there…It’s a part of an educational process for me”. Innovations are often presented in competitions, using these initiatives as dissemination channels, that introduce new products and bring awareness into architects and designers who have concerns regarding recent developments in their areas of work. This is especially important in the context under which we analyse the promotion of the photovoltaic technology development in the urban environment. • Integration: of the PV materials in the urban design concept, physically and aesthetically. • New PV technological concepts or new application of conventional PV technological concepts: use of PV materials in innovative ways. • Mass Production: entries should target mass-production concepts, where PV materials are used as part of a wider strategy on integrating renewable energy in the urban environment. • Communication: Entries should include an effective means of communicating to the wide public that the urban-scale structure has an embedded PV system. Additionally, and underlining the entrepreneurial concept allied to the competition, ideas ought to present a market/business potential within the geographical context they were aimed at, demonstrated through a simplified business plan. This simplified business plan was aimed at fostering competitors’ understanding of market needs and within this sense approach the market potential identifying the need to the project, the clients to who was aimed at, as well as identify the technological partners and the possible market barriers and constraints faced. The competition’s dissemination strategy was to address new actors, raising awareness on the technology and providing some background knowledge that would foster the development of new work areas and complementary competencies. To achieve this goal, the competition had a dedicated website and was advertised in architecture and PV related websites, magazines and conferences. Another dissemination action consisted of an approach to Portuguese schools of architecture and design, with dedicated presentations or dissemination material. At the end of the project submission period 130 projects had been registered at the competition’s website. The leaders were Portugal and the United States that registered 24 and 25 projects respectively, followed by Italy and France, respectively with 11 and 8 projects. The large majority belonged to graduated architects that registered as individuals, although designers also responded very positively to the competition. The range of ages from the competitors is wide from 19 to 68 years old and 29% were undergraduate participants, 48% of competitors graduated less than five years and 53% of professional for more then five years. Individuals registered 81 projects, while teams, mostly of two or three members, registered 49 projects. Regarding previous experience with PV technology and previous participations in competitions, 81% of the registered participants did not had any experience with PV while the participation in previous competitions was more balanced, with 55% experienced participants. From the 130 registered projects, 23 were actually submitted, which means a 17.7% success. Portugal was the leading country presenting six projects, followed by the USA and Netherlands, each with two projects. The submitted projects belonged in their majority to teams of recently graduated architects. Regarding previous experience with PV technology or in competitions, nine of the competitors had already had experience with the technology, while twelve had entered previous competitions. The submitted projects were evaluated by a panel of PV experts from IEA — PVPS-Task 10 that chose ten finalists projects, where ideas vary from a sustainable village concept to specific applications for PV in street furniture and even an original road safety application. The final judging panel, consisting of architects, designers and PV experts decided the winner and attributed three honourable mentions. Until very recently the solar thermal industry in Canada has been struggling to climb out of its position as a niche, cottage industry, primarily serving the residential and small commercial/institutional markets only. This is mostly due to historically low energy prices for both electricity and natural gas in comparison with other World markets. However other important barriers have been owners’ perceptions of risk associated with solar thermal in a primarily cold climate, maintenance concerns and also lack of access to capital. The introduction of the Power Purchase Agreement model through Mondial Energy Inc. — where the owner contracts with Mondial to pay for, own, install and operate the system, has removed these barriers, while bringing economies of scale to the solar thermal industry. As a result the largest solar thermal hot water systems in Ontario have all been built under this model in the past two years. This business model is now being adopted by local governments as a way for them to bring renewable energy to their buildings without having to manage the work and associated risk, or provide up-front capital.